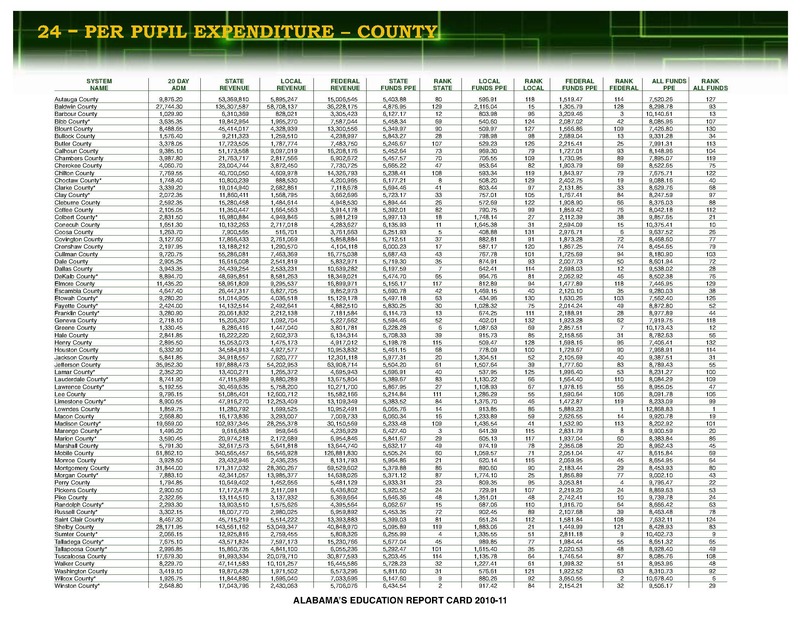 Alabama School Connection » School Budget Hearing Season Is Here!! It’s that time of year again! Time for your local school district to hold its mandated two public budget hearings, complete with confusing forms and acronyms that make the general public feel rather uninformed and unintelligent. Surely they don’t do that on purpose—it’s just the nature of the beast. 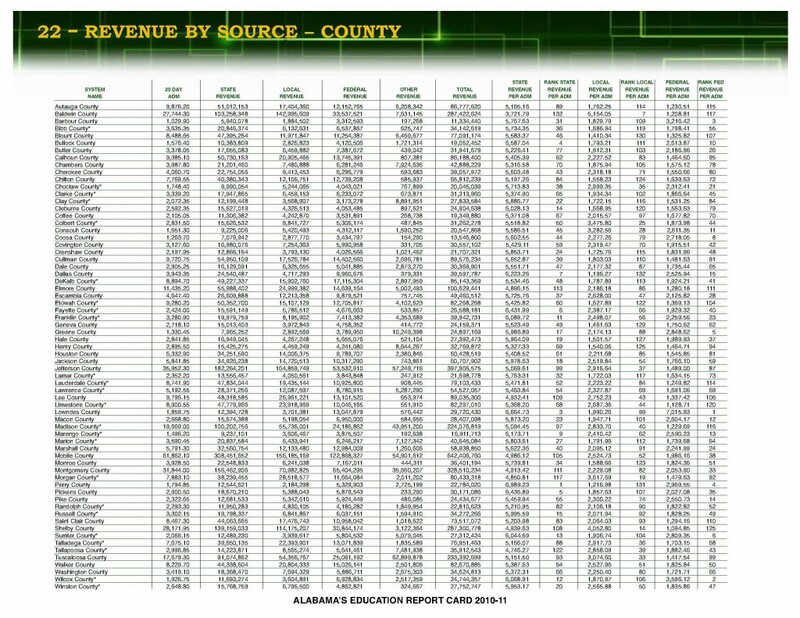 School districts in Alabama control over $7 BILLION in funding from state, federal, and local sources. Shouldn’t you take the time to find out how your school district plans to spend their portion of taxpayer-provided dollars? It’s really not that hard to understand what they’re talking about. We all understand the basic money-in, money-out concept, right? 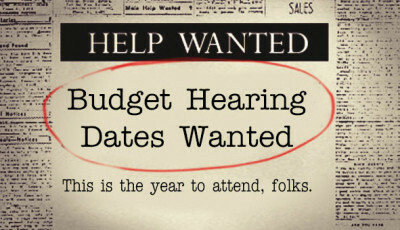 When Are Budget Hearings Going to be Held in Your District? 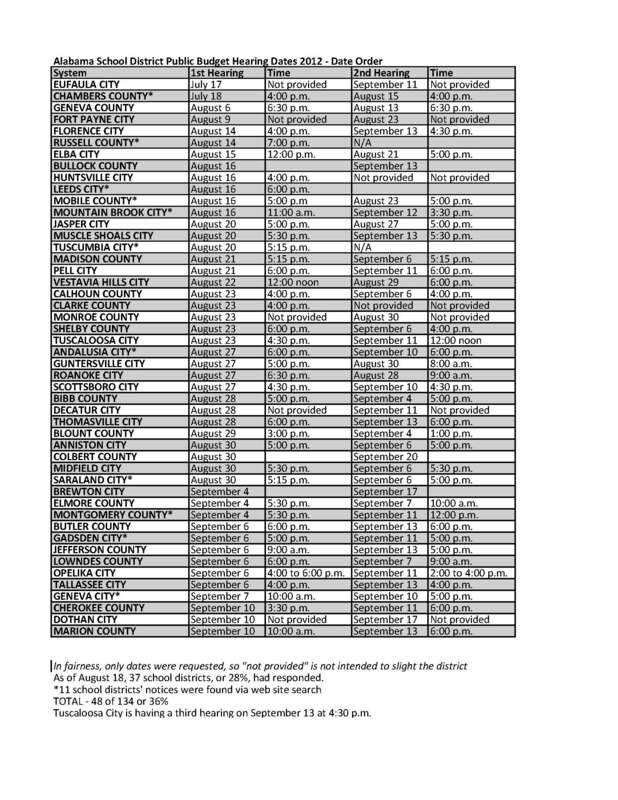 Each district’s board of education must approve their FY13 (October 1, 2012, to September 30, 2013) budget and submit it to the ALSDE (remember: Alabama State Department of Education) by September 15th. As you can see, many budget hearings are underway and two districts have already completed their hearings. 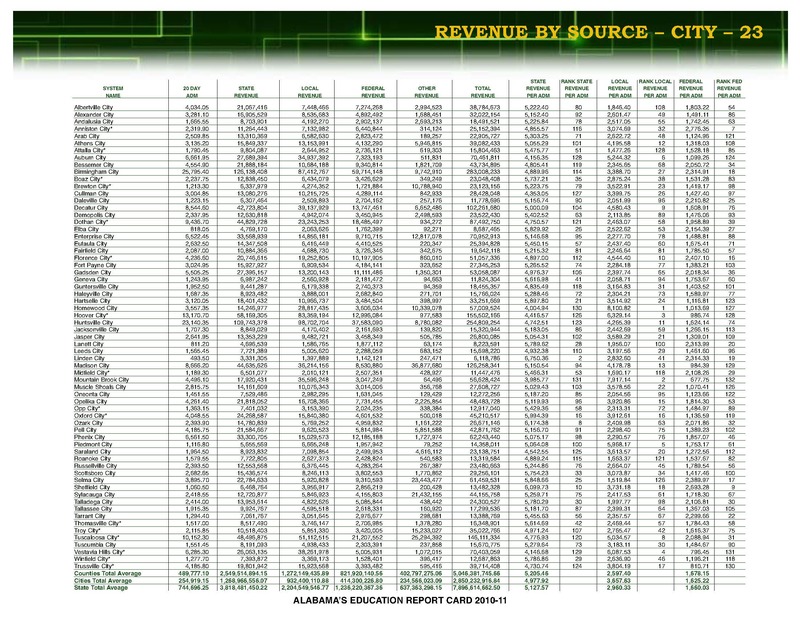 Here are the training documents used at the Alabama Association of School Boards’ “Public Budget Hearings For Alabama School Districts” from February 2012. They are meant for ordinary people like us and are easy to understand. The document provides wonderful guidance for districts wishing to put together meaningful budget hearing presentations to their school communities. Why bother? Simply put, school districts control and spend hundreds and hundreds of millions of dollars of public money ($3.8 billion in state funding [FY13 allocation], to be exact, plus another $1.2 billion in federal funding [FY11 numbers] and another $2.2 billion in local funding [also from FY11] ). That’s over SEVEN BILLION DOLLARS. For 740,000-plus students, or nearly $9,500 per Alabama student. Shouldn’t we in the community care about how those dollars are spent? Well here’s your chance to lend your voice!! So now you know why you should bother, right? Well, once you attend, how do you provide input? 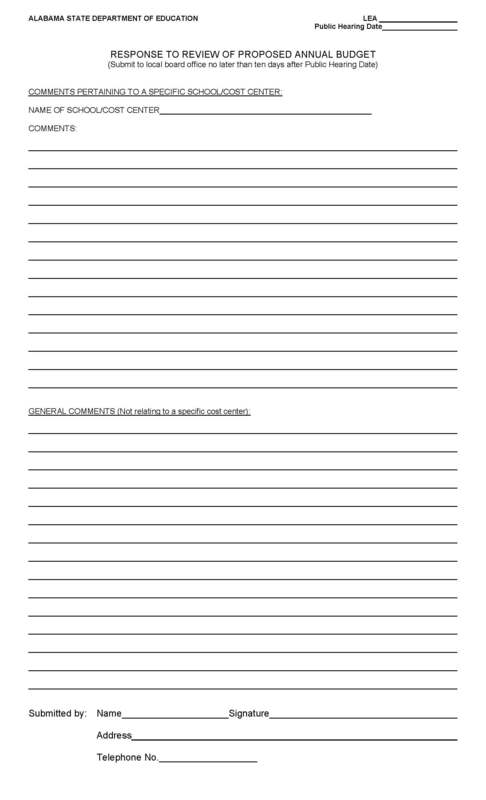 Here is the form on which you are expected to provide written input. Using this form is supposed to allow you to provide input into the budget before it is approved. But the timeline gets a little funky here: Budgets are due to the ALSDE before September 15, meaning that boards must approve them prior to September 15. 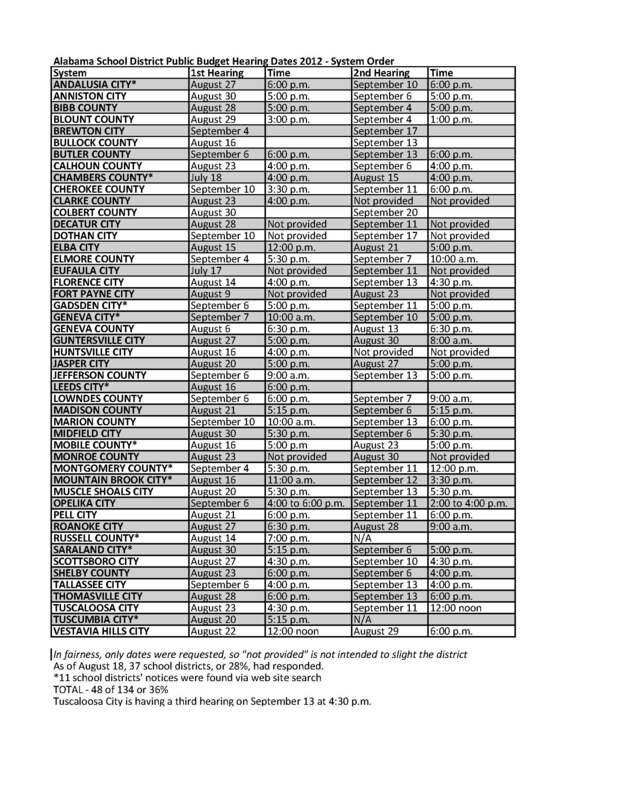 Meaning if the “ten day” window the form utilizes is adhered to, then budget hearings would be completed no later than September 5 to allow school personnel and school boards to meaningfully contemplate whatever input the public offered prior to approving them and submitting them to the state by the September 15 deadline. With all that said, it doesn’t appear that many districts have left enough time to allow for meaningful input. But the form is there for you to use. In my child’s school district, the public was allowed to participate and ask questions during the actual hearing. Not all school districts allow time for questions and answers, though, unless the board of education is doing the asking. Whenever I speak with board members in school districts, I ask them how many people usually attend their budget hearings. The most common answer is that none of the general public attend the hearings. Instead, teachers and administrators attend the hearings, if anyone does. Seven billion dollars. And we don’t even bother to go listen to how they plan to spend it, let alone provide our own input. Why are we so apathetic when it comes to spending SEVEN BILLION of our tax dollars? 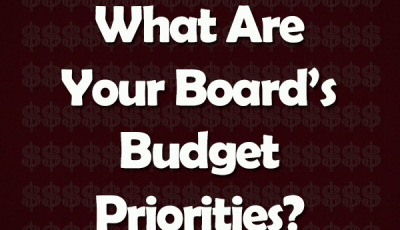 Now that you’re putting the date of your school district’s budget hearing on your calendar, take a few minutes to review this publication from the ALSDE. It will help you understand what the state’s “Foundation Program” is all about and will help you get familiar with key terms that you will hear during the budget hearing. School districts receive three types of funding: state, federal, and local. 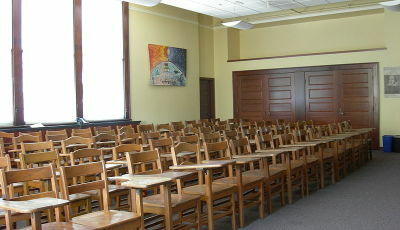 The Foundation Program covers state funding. You might want to read over the ASC’s so-far-only-two-part series about School Finance: Part 1 and Part 2. This post pretty much serves as Part 3. The Importance of Local Funding! Local funding includes funding from property taxes, sales taxes, contributions from legislators and municipal government entities. It is the funding that local communities and school boards have COMPLETE discretion over how to use (unless the tax that supplies the revenue has been pledged for capital projects, technology, or is earmarked in some other way). State and federal funding is always restricted and must be used by the district in some particular way. Local funding is how school districts are able to pay teachers more than the minimum state salary schedule. Local funding often pays for aides for children with special needs. Local funding is how athletic facilities are built, and how class sizes are kept low, and how salary supplements are paid to teachers to coach math teams, debate teams, athletic teams. Local funding also allows districts to be innovative in technology purchases. Local funding is the key to offering a school community’s children more than just the minimum of what the state requires our school districts to provide. Source: Alabama’s Education Report Card 2010-2011 (the latest one available). It should be easy to see that those school districts with the most available local funding are often those that provide many opportunities for their community’s children. Make the Time and GO! Budget hearings rarely last more than an hour. Two at the most (and that’s only if board members are very inquisitive). I attended my first budget hearing in 2003. It was just the Chief School Financial Officer and me. I learned so much in that budget hearing. The CSFO was very generous with his time and helped me develop a deep understanding of what-I-thought-were complicated concepts (that turned out to be very simple). Provide input, even if you believe it will be disregarded or aren’t sure you know what you’re asking. Public school employees should be responsive to the public that they serve. But if they are never asked, then they are never given that chance. 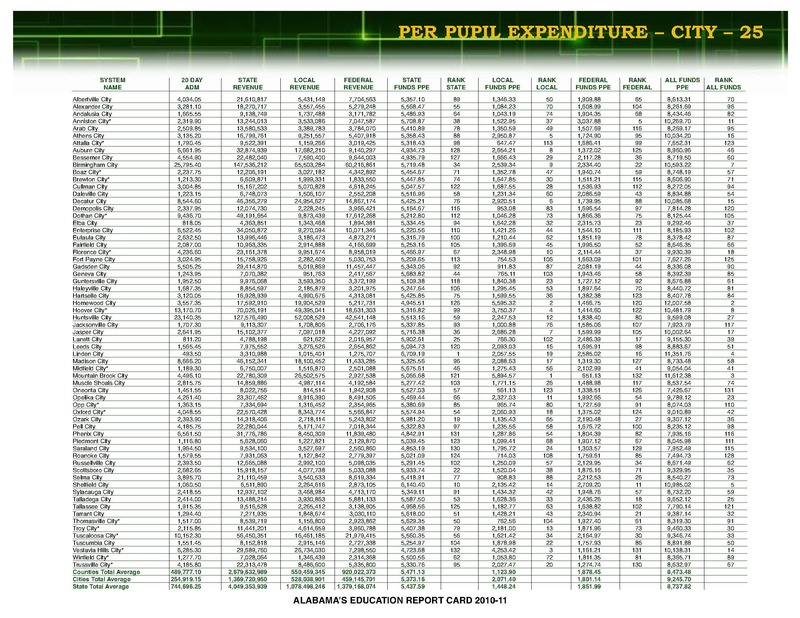 Remember, Alabama’s school districts control over SEVEN BILLION DOLLARS of our tax money. The law requires school districts to give their school community an opportunity to provide input into their annual school budget. Use your voice! November 13 is Parents Day! Have You Gotten Your Invitation Yet?